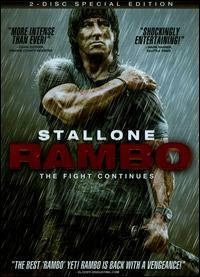 When a group of missionary aid workers in Myanmar disappear into the vast green inferno, vigilante Vietnam War veteran John Rambo (Sylvester Stallone) leaves his job as a Salween River boatman behind to accompany a group of mercenaries on a daring rescue mission. It's been 20 years since Rambo helped mujahedeen rebels fend off Soviet invaders in Afghanistan, and these days the former soldier lives a simple life in northern Thailand. Yet despite the fact that Rambo has long since traded in his guns for a fishing reel, the world's longest-running civil war rages into its 60th year on the nearby Thai-Burma border. It seems like every day more rebels, mercenaries, medics, and peace workers cross through the remote village where Rambo lives, most of them never to be seen again. One day, human rights missionaries Sarah Miller (Julie Benz) and Michael Burnett (Paul Schulze) show up asking Rambo to guide them up the Salween so they can get some much-needed food and medical supplies to the desperate Karen tribe. According to Sarah and Michael, the Burmese military has planted land mines all along the roads leading into the tribe's village, making it virtually impossible to reach the tribe via land. At first Rambo flatly refuses to cross into Burma, but these refugees will most certainly die without aid, and he eventually relents.